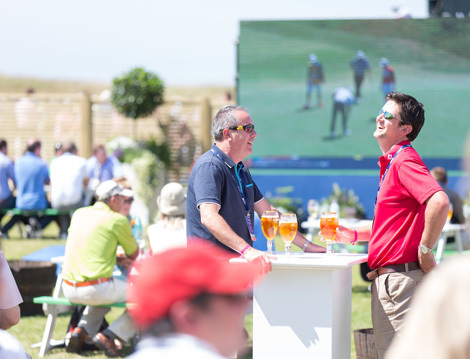 The Open Golf Championship also known as The British Open will provide VIP Hospitality facilities located within the vibrant Hospitality Village, you and your guests can walk directly on to the course and follow all the action. Facilities below are selling out. Please book quickly to avoid disappointment. Entertaining guests in Faulkner's Place VIP is an exclusive official hospitality experience at Royal Portrush. The VIP Faulkner's Place is a stylishly designed VIP lounge and restaurant overlooking the 1st fairway. From the moment of arrival, you and your guests will be treated to the finest selection of Northern Irish cuisine created by our award-winning chefs. Dedicated servers will ensure that all your requirements are looked after, leaving you to relax and soak up the atmosphere at golf's original Championship. This exclusive restaurant will offer you and your guests a luxury experience to enjoy your time at The Open. With its casual and informal environment, this exclusive lounge alongside the 1st hole fairway, is a unique place to relax with guests and watch the world's best start their round from the lower balcony. Situated alongside the 1st hole, you and your guests will view the players beginning their round. Special prices for online bookings only. Faulkner's Place VIP - £750 per person + vat. The Claret Jug Pavilion is located adjacent to the 1st Fairway and is perfect for businesses and private individuals looking to entertain guests in a VIP environment.. The luxury restaurant and lounge provides floor to ceiling views of the action throughout the day. Access is only be pre-booked arrangement and from the moment you and your guests arrive you will be treated to the finest selection of Irish cuisine created by our award winning chefs. This exclusive facility is fully air conditioned and you will enjoy Full Irish breakfast, warm pastries, porridge, fruit and smoothies together with tea, coffee on arrival. A Champagne and canapés reception will be offered during the late morning which will set you in the mood for a delicious four course a la carte luncheon served at your reserved table. Featuring local Irish produce and signature wines. Traditional afternoon tea with treats for you to choose as you watch the drama unfold. The VIP Claret Jug Pavilion- £800 per person + vat.